Meet the Master of Magnetism! Magneto, the X-Men's greatest foe-turned-ally. Limited edition statue stands about 16-inches tall. It's sure to attract attention from your family, friends, and fellow collectors! 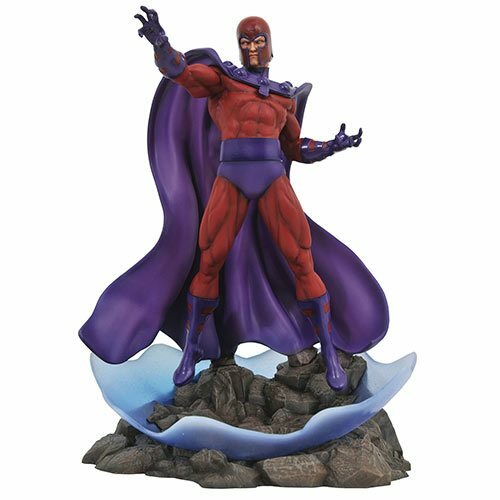 Magneto, the Master of Magnetism, is sure to attract a lot of attention when you unbox this 12-inch scale statue in front of your family, friends, or fellow collectors. Measuring approximately 16-inches tall, the resin piece depicts the X-Men's greatest foe-turned-ally hovering over a rocky promontory, summoning a translucent sphere of magnetic energy from the very ground beneath him! Limited to 3,000 pieces, this Marvel Premier Collection Magneto Statue comes packaged in a numbered full-color box with a certificate of authenticity. Ages 13 and up.